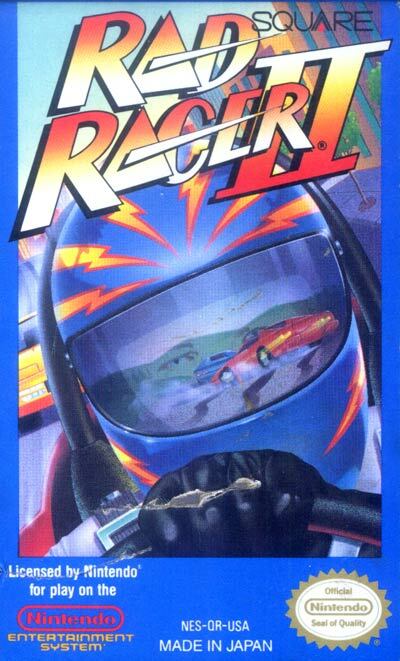 The gameplay of Rad Racer II is virtually identical to that of its predecessor: the idea of the game is to race around a course, and make it to check points before the fuel (gas) runs out. Some have questioned the "rad" factor of the game, citing it as minimal at most. If you hit another vehicle, road sign or tree at a high speed, the car crashes. Crashes take time and make it more difficult for the player to reach the check point. To help prepare for high-speed turns, the dashboard has a preview direction indicator, an arrow that indicates which direction the track will take in the next few moments, allowing the player to position the vehicle accordingly. Rad Racer II also allowed the player to select any stage through the title screen. At the title screen, press the B button one time less than the number of the stage on which you wish to race. Then press left, up, and start simultaneously. For example, if you wish to race on stage five, at the title screen press the B button four times. Then, left-up-start simultaneously.